You can create a Page or an RDL report that hosts a subreport. This walkthrough illustrates how to create an RDL report using a subreport. Note: This topic uses the Employee, Sale and SaleDetails tables in the Reels database. By default, in ActiveReports, the Reels.mdb file is located at [User Documents folder]\GrapeCity Samples\ActiveReports 13\Data\Reels.mdb. In the Add New Item dialog that appears, select ActiveReports 13 RDL Report and in the Name field, rename the file as Sales.rdlx. Click the Add button to open a new RDL report in the designer. In the Solution Explorer, select Sales.rdlx and set the Build Action property to Content and the Copy to Output Directory property to Copy Always. 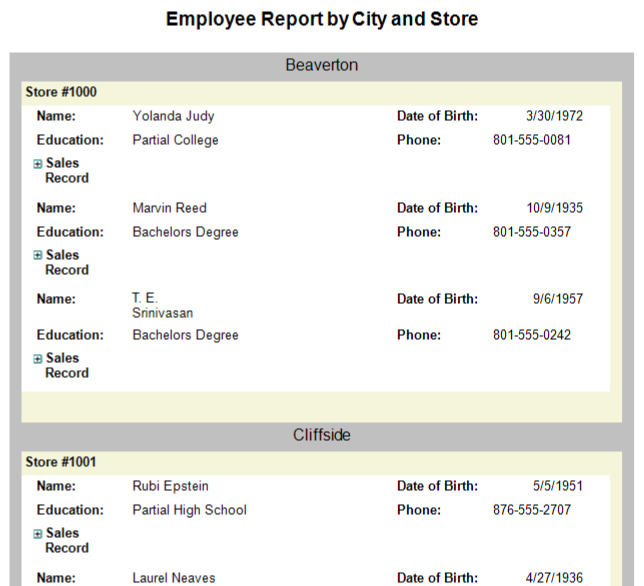 In the Report Data Source Dialog that appears, select the General page and in the Name field, enter a name like Reels. In the Report Explorer, right-click the Parameters node and select the Add Parameter option or select Parameter from the Add button. Under Data type, select Integer. When you add a query parameter using the syntax required by your database you must add a parameter to the Parameters page to ensure that the parameter value is passed to the query from the Report Parameters collection. In the DataSet Dialog that appears, select the General page and enter the name of the dataset as EmployeeSales. This name appears as a child node to the data source icon in the Report Explorer. On the Parameters page under Parameter Name enter EmployeeID. 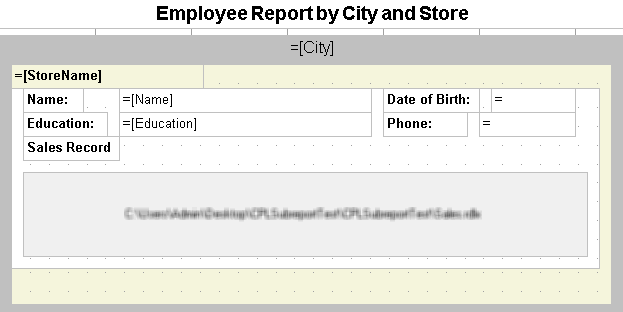 From the toolbox, drag a Table data region onto the body of the report and go to the properties window to set the DataSetName property to EmployeeSales. Click inside the table to display the column and row handles along the top and left sides of the table. Right-click the handle above the rightmost column and select Insert Column to the Right to add another column. Click the column handle at the top of each column in turn to select it, and in the property grid, set the Width property as indicated in the table. Tip: In most cases it is easier to resize existing columns before adding new columns because this prevents the table from growing horizontally and pushing the report width beyond what will fit on paper. Right-click the handle to the left of the table detail row and select Insert Group to open the Table-Groups dialog. Under Expression select =Fields!EmployeeID.Value. This groups all details from each employee. Change the Name to Employee and click OK to close the dialog. A grouping row is added to the table. Note: You cannot change the name of a table group until after you have set the expression. Right-click the handle to the left of the table detail row and select Edit Group to access the Table-Detail Grouping dialog. Under Expression select =Fields!SaleID.Value and click OK to close the dialog. This lists the total amount of each sale instead of listing each item sold within each SaleID. Right-click the handle to the left of the grouping row and select Insert Row Below. We will use this new row for static labels that repeat at the top of each new group. Right-click any handle to the left of the table and select Table Header to toggle off the table header. Right-click any handle to the left of the table and select Table Footer to toggle off the table footer. In the Report Explorer, select the Body node and go to the Properties window to set the Size property to 5.75in, 1in so that it fits inside the subreport control on the main report. In the Report Explorer, from the EmployeeSales dataset, drag the following field onto the first group header row of the table. Use the Shift key and the mouse to select the first two cells in the first group header row, right-click and select Merge Cells. 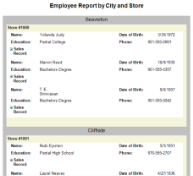 This allows the employee name to span two columns in the table. Using the handle to the left of the first group header row, select the row and set the BackgroundColor property to LightSteelBlue. Tip: Even if you do not want to use colors in your finished report, it is often helpful to do so during the design of a report to make identification of the various sections easier for troubleshooting when you preview it. Enter the following text into the cells in the second group header row of the table. Using the handle to the left of the second group header row, select the row and set the BackgroundColor property to LightGray. In the Report Explorer, drag the following fields from the EmployeeSales dataset onto the detail row of the table. In the detail row of the table, select the textbox with the Quantity data field and go to the Properties window to change the Value property to =Sum(Fields!Quantity.Value). This adds the Sum aggregate to the expression for the field and shows a summary of the quantity field for each SalesID. In the detail row of the table, select the textbox with the Total data field and go to the Properties window to change the Value property to =Sum(Fields!Total.Value). This adds the Sum aggregate to the expression for the field and shows a summary of the total field for each SalesID. In the Report Explorer, from the EmployeeSales dataset, drag the following fields onto the group footer row of the table. Notice that the value of fields dragged onto the group footer row automatically use the Sum aggregate function. Enter the following text into the indicated cell in the group footer row of the table. Using the handle to the left of the group footer row, select the row and in the BackgroundColor property select LightGray. Go to the preview tab, enter 1035 for the Employee ID, and click the View Report button. You get a layout that looks similar to the following at design time and at run time. From the File menu, select Save and save this file. This report functions as the subreport you use in the main report. From the Visual Studio Project menu, select Add New Item. In the Add New Item dialog that appears, select ActiveReports 13 RDL Report and in the Name field, rename the file as Employees.rdlx. Click the Add button to open a new fixed RDL report in the designer. In the Report Explorer, select the Body node and go to the Properties window to set the Size property to 6.5in, 3.6in. In the DataSet Dialog that appears, select the General page and enter the name of the dataset as EmployeeInfo. This name appears as a child node to the data source icon in the Report Explorer. Click the Validate icon to validate the query and to populate the Fields list. At the bottom of the Properties Window, select the Property dialog command. See Properties Window for further details on accessing commands. In the List dialog that appears, select Detail Grouping. In the List dialog, select Detail Grouping. NoRows No sales recorded for this employee during 2005. Note: To view the report in the preview tab, you should specify the full path to the subreport. On the Parameters page of the Subreport dialog, set the Parameter Name to EmployeeID. This name must match the parameter in the subreport exactly. Set the Parameter Value to =Fields!EmployeeID.Value. Note: You can use the option of having the subreport automatically apply the same theme as the hosting report. This option is available on the General page of the Subreport Properties. Click the preview tab to view the report. See Windows Forms Viewer to display report in the Viewer at run time. Note: Click the + to the left of Sales Record to see the subreport.